The Strathy Inn is a small, 200 year old coaching inn on the edge of the crofting community of Strathy on Scotland's far north coast. The Inn is surrounded by the beautiful scenery of northern Sutherland - heather clad hills, tumbling peaty rivers, dramatic cliffs and caves and golden sandy beaches. 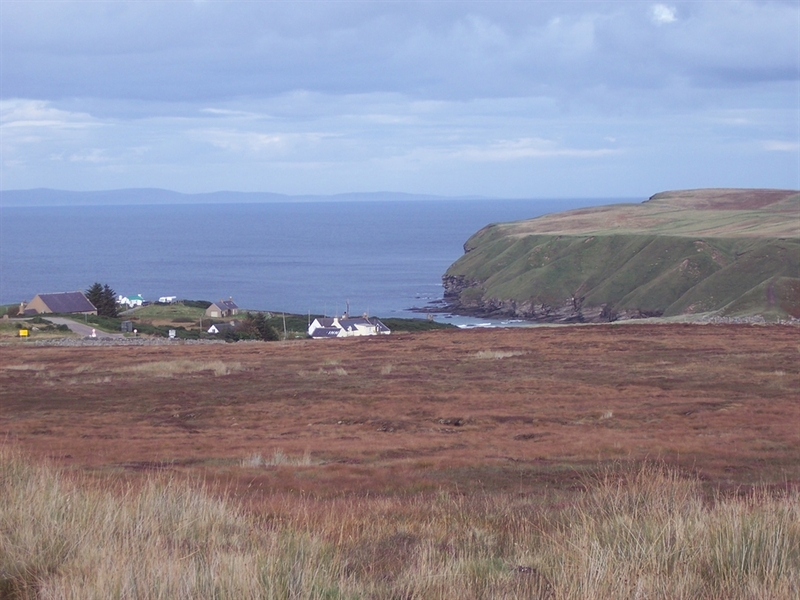 There are wonderful views across the Pentland Firth to Orkney, just a short day trip away. Outdoor activities abound with fishing, stalking, golf, pony trekking and surfing all available locally and endless opportunities to explore the area on foot, by bike or car. The area is renowned for its wildlife with many rare species of birds and plant life to be seen. Dolphins, seals, porpoises and whales may be spotted off the coast. The Strathy Inn is family run and our focus is on providing a relaxing and comfortable base from which visitors can make the most of the beautiful, remote and wild surroundings. We pride ourselves on providing good home cooked meals using local ingredients wherever possible. Our menus feature classic Scottish dishes and others with more international flavours. Our traditional bar features a wide range of bottled real ales and malt whiskies from the Highlands and islands. The Strathy Inn has three letting bedrooms - a ground floor double room with en-suite shower room, and on the first floor an en-suite family room (one double and one single bed with room for a cot or further temporary bed) and a small double bedroom usually let as a single, which has a private shower room. The small double has a sea view. The other rooms look south across moorland. All the rooms have tea and coffee making facilities, hair dryers and televisions. The breakfast room is situated on the ground floor and guests are invited to choose from a menu with dishes ranging from a full traditional Scottish breakfast, through light choices such as scrambled egg on toast or a bacon sandwich, to continental options such as croissants or fruit salad. A sun lounge is available for resident guests. In the breakfast room there is a range of books and games to occupy you on days when you may not feel like venturing out. There is free wifi access for resident guests. The Strathy Inn has a cosy fully licenced bar with an open peat fire. Here we serve drinks, lunches and evening meals to both residents and non-residents. The letting accommodation is completely separate from the bar, which has its own entrance. The Strathy Inn is a small enterprise run exclusively by the proprietors, Craig and Heather Frost. It is our family home and, as such, we hope that guests will appreciate our personal welcome and the relaxed and cosy atmosphere combined with the facilities of our well stocked bar and varied menu.